The Trump administration’s re-imposition of sanctions on Iran will go a long way toward choking off the Islamic Republic’s financial support for its terror proxies Hizbullah and Hamas, Washington’s special envoy to Iran said. Earlier this week, Hamas and other Palestinian terror groups in the Gaza Strip fired over 460 rockets and mortars at Israeli territory over a 25-hour period. The Israeli military responded by striking some 160 sites in Gaza connected to Hamas and Iran-backed Palestinian Islamic Jihad before a Hamas-announced ceasefire took effect on Nov. 13. 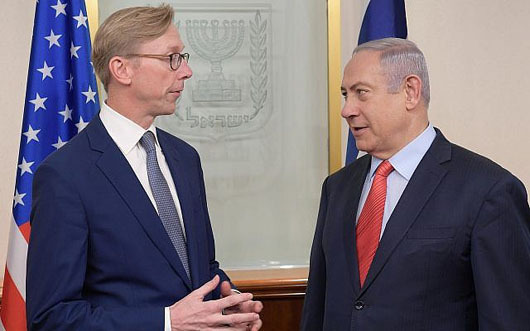 “Now that we have re-imposed our sanctions, we are in a position to really go after all the revenue streams Iran uses to fund Hamas and Hizbullah, its missile proliferation – all the threats to peace and security that Iran presents,” Brian Hook said on Nov. 15 prior to a meeting with Israeli Prime Minister Benjamin Netanyahu. Iran has helped Hizbullah and Hamas to build significant rocket arsenals that are directed at Israel. Hook said the sanctions gave companies around the world a choice: to do business with the U.S. or Iran. “Given the size of the U.S. market compared to the Iranian market, all major firms choose the U.S. market,” he said. Hook noted that Iran’s rial has sunk by 75 percent this year, and that 100 major companies have announced they are pulling out of Iran. In addition, the SWIFT banking network, the main mechanism for international money transfers, announced earlier this week that it cut off 50 Iranian banks. “The combination of all these things has a very powerful effect and the Iranian regime has to decide whether they want to keep promoting terrorism and instability around the Middle East or they can watch their economy collapse,” Hook said. The International Monetary Fund has forecast that the sanctions will cause Iran’s economy to contract 1.5 percent this year and 3.6 percent next year.